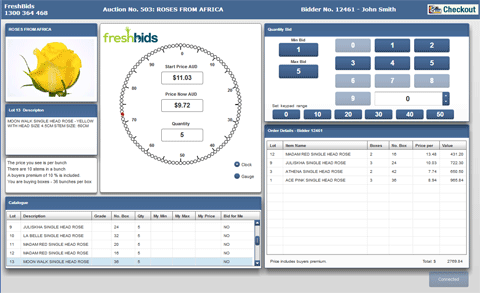 If you logon before the auction starts you will see a count down to when the auction starts. Once the auction time is reached the first lot is automatically started and you will see a picture and description of the 1st lot appear in the top left of the screen. When the auction starts you will see the red dot move around the clock. Each revolution of the clock represents $1. Using the example you will see that the price is now $9.72 -have a look at the red dot: it's pointing to 72. The red dot travels around the clock as the price reduces and represents the cents of the current price. Bid for me - YES. This means the system will automatically attempt to buy your required quantity at the nominated price. Bid for me -NO. This allows you to pre-enter the quantity you require. When the lot starts you will see your quantity in a green button. Just click this when you are happy with the price. In the right hand corner of the screen you will see the quantity keypad. When the price reaches the price you are prepared to pay just click on the quantity button you want to buy. 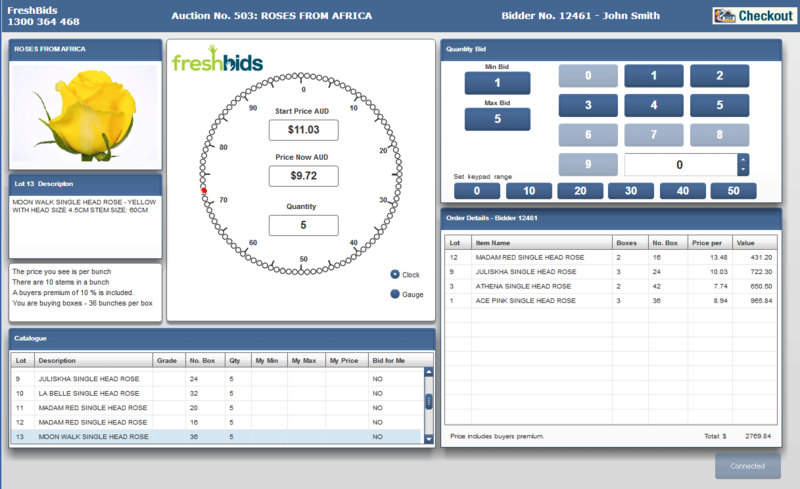 From the example if you wanted to buy the full lot of 5 boxes at the current price of $9.72 per bunch you would click the '5' button (maximum bid). As soon as you buy the clock will stop whilst your order is processed and will then re-start at a price a little higher than before if there is any quantity left to sell. Let's say you wanted to buy 35 boxes. Click the 30 button in the keypad range. This will change the keypad from 0 to 9 to 30 to 39. Then click the 35 button. Just below the Quantity keypad you will see the items that you have bought and the price.